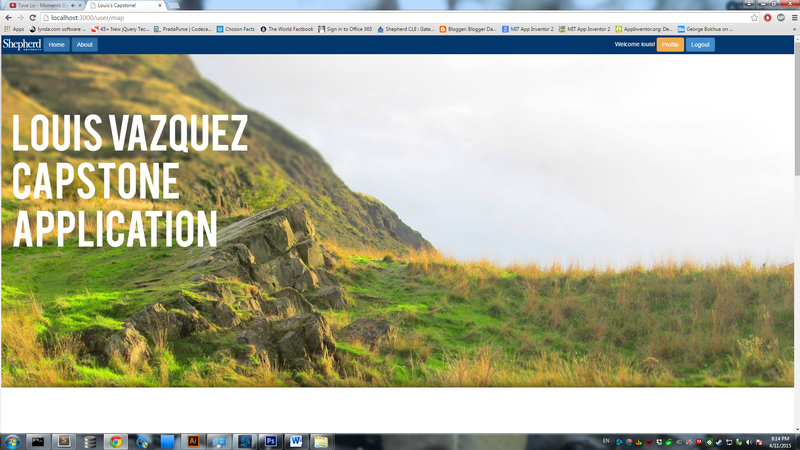 For my Senior Capstone Project I planned to work with the Study Abroad office a to create a website that would highlight and showcase the experiences of Shepherd students that have studied abroad. The photos and descriptions would be used by the Study Abroad Office to encourage students who have not studied abroad to do so. It would also try to promote different study abroad options for the Office such as the SGA Scholarship and programs like AIFS and ISA in a better way than the current site does. I worked with, MapBox, Ruby on Rails, Leaflet and Bootstrap. I came up with the idea because I have studied abroad In London, and in Seoul both were the best time I’ve ever had and I wanted to do something with it. I wanted a way I could scrapbook my trips, and plan new ones visually. I also wanted to see what other people have done and be able to talk to them about it. Everyone should study abroad at least once; this is a good way for people to see all the awesome stuff that can happen then be encouraged to go themselves. Actually building this thing was a lot harder than I thought. It wasn’t really how much I had to code because that wasn’t an issue. It was for the most part I had no idea what I was doing! RoR has a pretty steep learning curve and I ran head first into it. So that was tough. Almost everything that I thought would be simple turned out not to be! Although it was a rush when I figured something out, and its moments like that when you “crack” the problem that makes me like to do this stuff. Although at times it is awfully demoralizing when you realize you just ruined all of your migrations because you were trying to be lazy and you have to reset everything. Or when you started something simple and everything is going as planned when suddenly you get error after error thrown at you! Either way I finished it, and it was probably the hardest thing that I have ever had to make. It took forever, including around 3 months of almost constant research and coding. It was my life! If anyone reading this knows RoR and wants to test their hand at it, please help continue and finish this project!